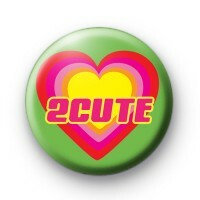 This is a listing for a cute 25mm pin badge. Its bright green with red, pink and yellow gradient coloured love hearts and the words 2 Cute written across the centre. This is a fun badge to give as a handmade Valentine's gift or to someone special just as a reminder of how cute they are! It's a super fun & sassy badge and we think it would look great pinned to your coat. We have lots of slogan badges in the shop and quite a few Valentines and romantic-themed ones.